Free Report Form Pro 2 home inspection report-generating software that’s compatible with both iOS and Android devices– that’s a $400 value! Environmental inspection training, including certification in radon and mold detection – a $200 value that’s free of charge! When you’ve finished your home inspector training, you’ll be mailed a Certification of Completion as verification that you have successfully completed Inspection Certification Associates’ home inspector classes. At that point you can also initiate your free one-year InterNACHI membership. 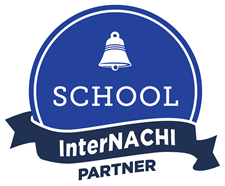 InterNACHI is the largest association of certified home inspectors. Enrolling in ICA’s online Home Inspector Training covers more topics and goes far beyond training offered by our competitors. To see a summary of the advantages of receiving your home inspection certification through ICA rather than other inspection training schools, click here. Because all ICA training is online, you can work at your own pace. All instructional and reference materials can be accessed using a smartphone, tablet, laptop or similar digital device any time and anywhere there’s an Internet connection. The online home inspection course content can also be downloaded and viewed offline as well. One you’ve completed your training and receive your ICA Certification, you’re on your way to an exciting and rewarding new career as a home inspector. Having completed our Real Estate Inspection Certification Program, you’ll be qualified to inspect commercial as well as residential properties. Enrollment in ICA’s training program also includes course material on starting and promoting your new home inspection business. You’ll also enjoy the freedom of being your own boss and setting your own schedule. With that freedom, however, come the risks of being an entrepreneur and the responsibilities of building and maintaining a successful business. Inspection Certification Associates will always be there to help. If you have questions or need technical assistance while getting started – or for that matter, any time during your career as a home inspector – you’ll have free access to ICA’s reference library and training materials. Your ICA Home Inspection enrollment also includes free lifetime instructor support, so the personalized expertise you need is always just a phone call or email away. A great way to generate inspection leads in your area is to be listed in a home inspection directory. One of the leading directories is Hire An Inspector, which connects real estate agents, lenders, homebuyers and others needing an inspection by certified home inspectors. To be listed in the Hire An Inspector directory normally costs $200 per year, but as a graduate of ICA Home Inspection Training, you’ll receive a free lifetime listing. By enrolling now, you can begin building your home inspection business in just a few short weeks. 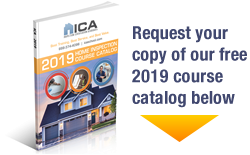 ICA’s 2019 Home Inspection Course is a 120-hour training program that enrollees complete at their own pace. On average, most students finish in three to four weeks. Some students, however, finish in as little as a week to ten days. Enrolling in Inspection Certification Associates’ online training is the most efficient, all-inclusive and affordable means of starting a new career as a professional home inspector, but don’t just take our word for it. Here’s what ICA graduates say about ICA’s online home inspection training. Why wait? To enroll in Inspection Certification Associates’ online Home inspection Course today, click here. You can also enroll by phoning us at (888)374-4096. Either way, you’ll receive an email with your course login information, which will let you start your training today!